"Serving Northern New Jersey for Over 28 Years"
Get quality service for any home project, big or small, from New Jersey's leading home improvement contractor. I was very pleased with the workmanship on my addition; everything was top notch and the price was right. The work was done efficiently and in a timely manner. I do not hesitate to recommend Can Do All! - Patricia C.
Ron and his crew did a great job for me, left the house clean when job was complete. Would call him again when needed! - Byron L.
Over the years we have had many contractors do work for us. I only wish I had known about Ron and his company. Outstanding work and no angst whatsoever. I highly recommend CAN DO ALL! - Al G.
Can Do All is a full service, owner operated home improvement and remodeling company that has been serving Northern New Jersey residents since 1988. We started as a handyman company taking on the many small jobs larger contractors didn't want. Our satisfied clients played an important part in our growing into a full-service remodeling company. 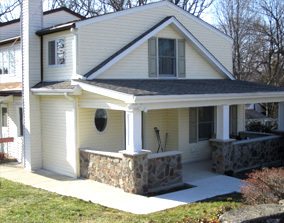 We have done all types of projects from the small repair to building a new home. Including handyman services, kitchen and bath renovation, decks, windows, and much, much more! Whether the job is large or small, Can Do All gives your job its full attention. From start to finish, we’ll give you reason to have a “Can Do” attitude. Save time and money by calling a professional contractor that can handle all your home repairs. The contents of this webpage are Copyright © 2019 Can Do All. All Rights Reserved.